Ah my friend, just take comfort from the fact that no matter how few pencils are available in your market, its many times as many as in mine. This is one time where us Kiwis must concede defeat to the Land of Waltzing Matilda. Faber castell wider choice in NZ according to website - you get the TK Fine Vario we don't. Staedtler website more choices in NZ - the Graphite777 has a wider range in NZ 0.5/0.7 in more colours. Zebra pencils rarely seen here but I gather they are obtainable in NZ. I'm lucky with a KINOKUNIYA in Sydney for a reasonable Pentel and some Pilot but I don't consider them part of the usual stationary scene as they source there product direct from Japan. Pilot Nextage and sometimes Supergrip - little else. Uni not sighted here. Then of course low end supermarket stuff like BIC, papermate etc which I'm sure you have over there. From what I've seen on Google search you have a fantastic vintage pencil auction house for which I have seen no equivalent in Australia other than EBAY. Looks like a nice addition to a collection of writing pencils, but it might not perform so well for drawing applications. Those conical sleeves tend to break the lead in my experience. I'm always looking for a good mechanical pencil to add to my collection. Where can I find this officemax pencil in Australia? I have this pencil, and so far I have been unable to determine whether the clutch is plastic or metal. 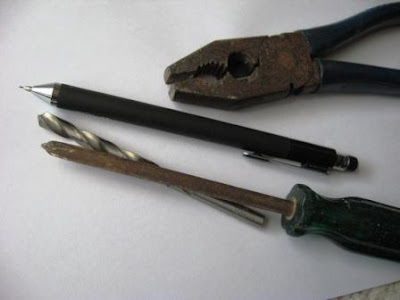 The tip does not unscrew from the pencil mechanics to reveal it, so it is hard to tell. My guess is that it is metal, because it is such a high quality pencil. I guess you could find out if you were willing to destroy the pencil, but have you been able to find out without destroying it? I haven't gone looking, but i can't imagine it would be plastic. quality make the money I spent for these two writing instruments well worth the investment. By the way, when they say, "semi-automatic" I think they mean that the user needs to perform an action (click the button) for the lead to extend out a bit. If that is the case, then every mechanical pencil that I have ever used is semi-automatic. If the user did not need to do anything for the lead to extend, that would be "fully-automatic" (I guess). If what I have said is true, this mention of "semi-automatic" on their package would then only be a marketing gimmick. On further investigation of other claims of semi-automatic, it just means a sliding sleeve. Regarding my Sept 12th comment about every mechanical pencil that I had ever used was semi-automatic: Later that day I had to go to Stop & Shop to buy a few groceries and upon perusing the small stationary section, I noticed that there is a pencil made by Dixon Ticonderoga that looks pretty much like a regular wooden case pencil (painted silver), but has "Sensematic" written on the package. It was cheap so I bought one. You don't have to do anything to extend the lead. The lead seems to be spring loaded and keeps extending out as the lead wears down. No action is needed even to start the process. I would call this a fully automatic mechanical pencil. I noticed that I had to hold the pencil nearly completely vertical to make it work properly though. These pencils come in 0.5mm and 0.7mm and are entirely plastic. They're very cheap, so if you love and collect mechanical pencils like me, it might be worth having at least one in your collection. Pick this TUL on my lunch break because Office max is in the same parking lot where I work. but it's kinda like drawing or writing with a stick. It just seems brittle playing around with it it might be the sleeve or something else. Could be the reason why sleeves are usually thin to begin with. I tried a different HB lead and it was to the same effect. 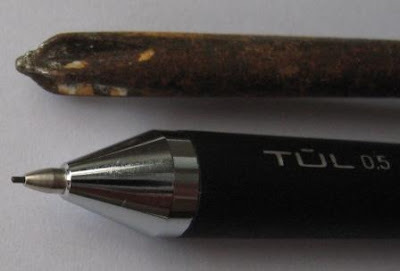 I have the Tul 0.5 pencil, ran through the first bit of lead that came with it, and now I can't seem to get the new lead loaded into it. I pulled out the eraser unit, loaded the 0.5 lead, and it will not extrude through the end no matter how many times I click it. Any thoughts as to why? 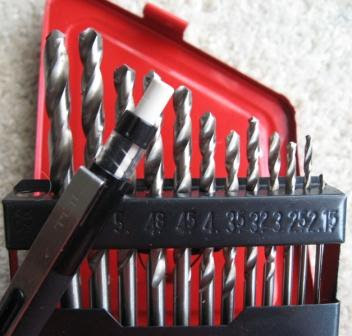 I'd try holding the top button down and sticking some lead into the tip to refill and see if the mechanism is then still advancing OK, just not feeding new lead in from the top. See also 'Clearing A Jammed Pencil' in the sidebar. Also how many sticks of lead did you refill it with? Try just 2 or 3 so there's plenty of room for them to move around. Hi...thanks so much! I managed to get it all taken apart using your 'clearing a jammed pencil' and the link to the Pentel website (the mechanism looks much the same after I got it apart). I think there is a piece of lead jammed right in the very tip of the pencil, but without a clean out rod (or a needle) I can't get to it. Aggravation! I'm going to put all the pieces in a baggie and take it home...hopefully I'll have the right tools at home for this operation. I very much appreciate your help, without it I might have just given up! I have had this pencil for a couple of years now and I love it! Can't stand to be without it! I really like the thinness of it, fits anywhere for carrying purposes, and I also love the grip that covers the entire pencil, really appreciate that it isn't sticky or weird feeling and I can grasp it anywhere rather than being "forced" to hold it like on other pens/pencils that have a fat section. Absolutely love the sleek, elegant and classic look. Great pencil at a great price! I have been a closet pencil enthusiast for just over a year now, as I have gone back to school for a degree in mechanical engineering. My favorite pencil so far in the cheap category is this Tul. Its a great tool. I do have two complaints, the eraser mechanism retracts the eraser when you use it. Perhaps this is a design feature? Automatic retracting eraser? ha! My second complaint only becomes obvious after moderate/heavy use, the Tul logo printed on the barrel is long gone. Some debate here, as I continue to get compliments on the Tul, sans printed logo. ...and the only mechanical pancil I have that has an eraser worth using is my Pentel "Twist Erase" which is a horrible excuse for a pencil otherwise. It gets some duty as a handy single unit .5mm, for some fast paced exams. Not having to reach for a block eraser honestly has saved me time. I have a Lamy 2000, a Pentel Graphgear 500, and a crap load of inferior pencils. The ones that I carry to class are the Tul, and the Pentel 500. The Lamy stays at home, where it gets the majority of my homework duty. I can't stand thinking about losing it, so home duty is what it gets. The Tul is my favorite cheap pencil, honestly I reach for it above my Pentel Graphgear. There is something of the timeless in its simple design, and the balance is excellent if you are like me and twirl the thing about your thumb for no apparent reason. Glad you've got your courage up and ventured out of the closet, out into the bright sunlight. The sunlight is bright, and antiseptic. ...I think they might be planning a raid on the local stationary store. 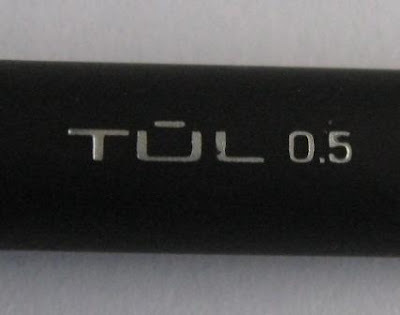 Any idea of what brand of lead refills to use with the TUL mechanical pencil. I bought some a couple months back but it doesn't feel like the same lead that originally came with the pencil. I know there are different levels of hardness for the refills but, I don't know which one originally came with the pencils? I checked the website and they don't seem to have any info posted. Thanks. I'd suggest you try Pentel leads and find a hardness that suits. Thanks for the suggestion and the article link. I've used this for a long time now, and enjoy it a lot. It was inexplicably difficult to find a mechanical pencil with both a retractable tip and an extending eraser, but on top of that I wanted a relatively small eraser rather than the standard large size. On the downside it's very difficult to find replacement erasers without ordering online and paying for shipping, though at least you can use the Papermate Megalead erasers, which are 1/3 the price and identical. Just a quick note: the clutch IS plastic, but it seems to work quite well regardless. I just bought a two pack of Tul mechanical pencils. BEST pencil ever!! I purchased a 2-pack of these at Office Depot a couple of weeks ago for $6.99. They are available in 0.5 and 0.7, though I had to hunt a bit for the 0.5. The package is also nicer than most at this price: an easy open plastic clamshell, rounded at top and bottom, with a brushed metal-looking card insert. I quite like these pencils. The look, weight, and feel are nice, and the width fits my big fingers well. I also like that I can grip it anywhere. I don't love the exposed eraser and clear eraser cartridge, but at least the eraser is more useful than most. 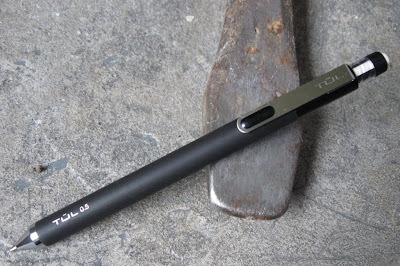 So far, the TUL is my top pencil under $5, edging out the Pentel Energize. More than one of you mentioned a retractable tip. Pardon my dullness, but how does one retract it? I've tried everything I can think of, and it's always still ready to scratch or poke. Otherwise I like the pencil. I carry it inside a piece of large-bore plastic straw that is taped firmly to the top edge of my old-school planner book. Well many years have gone by, but assuming the TUL is still the same mechanism then you it is the standard process that works on many pencils. You push the top button down as if advancing the lead, and hold it down, then push the tip back up inside the body by pressing it down on your desk or other surface... all the time holding the top button pushed down. Tried that, but the pressure shatters the lead inside the pencil. I use steady but firm pressure and get this result every time. Afterward, when I press the top button down multiple times, eventually a 1cm piece of lead comes out the tip, followed by pieces of shattered lead, followed by usable lead. This is the original piece of lead that came with the pencil. 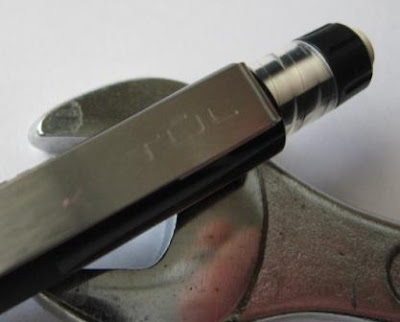 So if you have some lead sticking out of the tip, if you push and hold the top button down, can you push the lead back up inside the tip with your finger? Yes, that works. Is that what is meant by "retractable"? I have been trying to move both the lead and the tip back up into the metal ferrule, because the exposed tip also scratches and pokes. The method Dave proscribed on Monday--pushing the tip against something firm whilst holding the advance button down--is indeed the standard way of retracting the tip for this pencil (and many others.) To be clear, you do have to let pressure off of the top button as you simultaneously push the body of the pencil down. If that is what you're doing, and it doesn't work, there's a problem. As a follow to Dave's question today, can you slide the tip back into the body without pressing anything? Not the lead, just the nose cone. 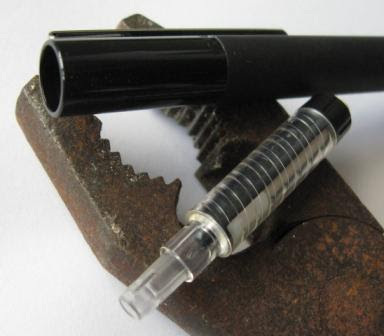 Lars, the tip does slide into the ferrule easily. Thanks for your clarification -- I didn't have the notion of letting pressure off of the top button after pressing it down. I just kept pressing it, expecting the tip to retract as I pushed against the lead and tip. Yes, your instruction is my answer! Thank you and thanks to Kiwi-d! Glad to hear the problem is solved, thanks to Lars. I will have to do better with my explanations in future!